Select Equities recently published a deep dive on the ASX stocks best leveraged to surging Chinese demand for Australian products, and also the key trends in the three different routes to the Chinese market, including the all-important Daigou channel. "Rapid growth in the Chinese economy is one of the strongest catalysts affecting ASX listed stocks and investors in the Australian and New Zealand share markets today. The opportunity presented to Australian and New Zealand businesses by growth in the Chinese economy has evolved from one that was focused on hard commodities a decade ago to now including value added goods and services. 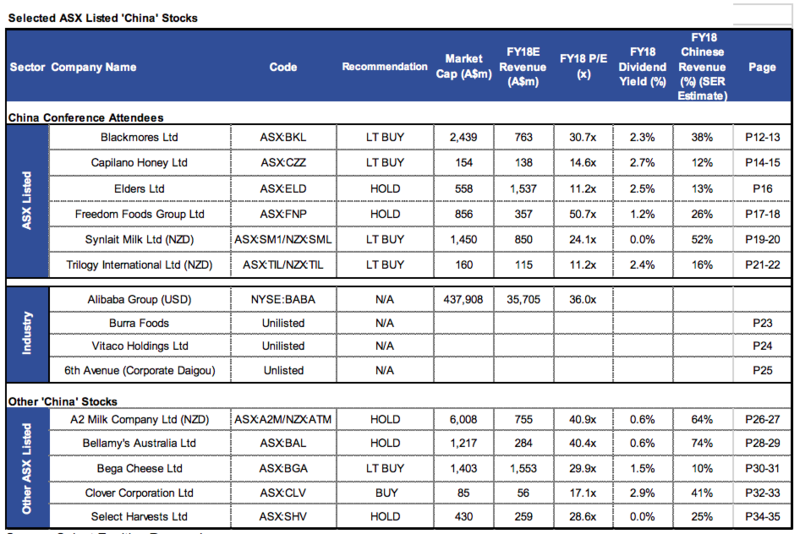 A number of ASX and NZX listed stocks are benefiting from China segment revenue growth, either directly or indirectly and either actively or passively. We highlight some of these in this note, with introductions for a number of unlisted companies. A number of factors are currently driving and affecting the three key routes to market into China for ANZ brands, which include Cross Border E-commerce, the Daigou channel (individuals sending good to China) and General Trade. A disruptive cross-border e-commerce regulatory change was announced by the Chinese government in April 2016, heavily impacting ANZ brands selling their products into China via both CBEC and Daigou channels. Bellamy’s Australia Ltd and Blackmores Ltd were two notable casualties of this disruption. Since then we have seen the Chinese government significantly relax CBEC regulations, including via the announcement of two critical grace period extensions announced in March and September 2017. This has facilitated a resumption of rapid growth of Chinese demand for ANZ brands. Australia and New Zealand are comparatively well positioned to benefit from this rapidly growing demand with their close proximity to China, favourable time zone differences, strong brands, and supportive trade agreements with China. Doing business in China can be very complex, either from a route to market or regulatory perspective. Similarly the pace at which these factors change can also be quite confronting. We believe the companies who will benefit most from this opportunity will be those with the most sophisticated strategies of doing business in China, and also those who are most capable of adapting to changing circumstances. To illustrate this we include detailed tracking data, and on the ground Daigou market analysis, for a number of leading ANZ brands.